This enzyme participates in the pentose phosphate pathway (see image), a metabolic pathway that supplies reducing energy to cells (such as erythrocytes) by maintaining the level of the co-enzyme nicotinamide adenine dinucleotide phosphate (NADPH). The NADPH in turn maintains the level of glutathione in these cells that helps protect the red blood cells against oxidative damage from compounds like hydrogen peroxide. Of greater quantitative importance is the production of NADPH for tissues actively engaged in biosynthesis of fatty acids and/or isoprenoids, such as the liver, mammary glands, adipose tissue, and the adrenal glands. G6PD reduces NADP+ to NADPH while oxidizing glucose-6-phosphate. G6PD is widely distributed in many species from bacteria to humans. Multiple sequence alignment of over 100 known G6PDs from different organisms reveal sequence identity ranging from 30% to 94%. Human G6PD has over 30% identity in amino acid sequence to G6DP sequences from other species. Humans also have two isoforms of a single gene coding for G6PD. Moreover, 150 different human G6PD mutants have been documented. These mutations are mainly missense mutations that result in amino acid substitutions, and while some of them result in G6PD deficiency, others do not seem to result in any noticeable functional differences. Some scientists have proposed that some of the genetic variation in human G6PD resulted from generations of adaptation to malarial infection. G6PD is generally found as a dimer of two identical monomers (see main thumbnail). Depending on conditions, such as pH, these dimers can themselves dimerize to form tetramers. Each monomer in the complex has a substrate binding site that binds to G6P, and a catalytic coenzyme binding site that binds to NADP+/NADPH using the Rossman fold. For some higher organisms, such as humans, G6PD contains an additional NADP+ binding site, called the NADP+ structural site, that does not seem to participate directly in the reaction catalyzed by G6PD. The evolutionary purpose of the NADP+ structural site is unknown. As for size, each monomers is approximately 500 amino acids long (514 amino acids for humans). The proline at position 172 is thought to play a crucial role in positioning Lys171 correctly with respect to the substrate, G6P. In the two crystal structures of normal normal human G6P, Pro172 is seen exclusively in the cis confirmation, while in the crystal structure of one disease causing mutant (variant Canton R459L), Pro172 is seen almost exclusively in the trans confirmation. The NADP+ structural site is located greater than 20Å away from the substrate binding site and the catalytic coenzyme NADP+ binding site. Its purpose in the enzyme catalyzed reaction has been unclear for many years. For some time, it was thought that NADP+ binding to the structural site was necessary for dimerization of the enzyme monomers. However, this was shown to be incorrect. On the other hand, it was shown that the presence of NADP+ at the structural site promotes the dimerization of dimers to form enzyme tetramers. It was also thought that the tetramer state was necessary for catalytic activity; however, this too was shown to be false. Interestingly, the NADP+ structural site is quite different from the NADP+ catalytic coenzyme binding site, and does contain the nucleotide-binding fingerprint. Glucose-6-phosphate dehydrogenase is stimulated by its substrate G6P. The usual ratio of NADPH/NADP+ in the cytosol of tissues engaged in biosyntheses is about 100/1. Increased utilization of NADPH for fatty acid biosynthesis will dramatically increase the level of NADP+, thus stimulating G6PD to produce more NADPH. G6PD is remarkable for its genetic diversity. Many variants of G6PD, mostly produced from missense mutations, have been described with wide ranging levels of enzyme activity and associated clinical symptoms. Two transcript variants encoding different isoforms have been found for this gene. ↑ Thomas D, Cherest H, Surdin-Kerjan Y (Mar 1991). "Identification of the structural gene for glucose-6-phosphate dehydrogenase in yeast. Inactivation leads to a nutritional requirement for organic sulfur". The EMBO Journal. 10 (3): 547–53. PMC 452682 . PMID 2001672. ↑ Aster J, Kumar V, Robbins SL, Abbas AK, Fausto N, Cotran RS (2010). Robbins and Cotran Pathologic Basis of Disease. Saunders/Elsevier. pp. Kindle Locations 33340–33341. ISBN 1-4160-3121-9. 1 2 Cappellini MD, Fiorelli G (Jan 2008). "Glucose-6-phosphate dehydrogenase deficiency". Lancet. 371 (9606): 64–74. doi:10.1016/S0140-6736(08)60073-2. PMID 18177777. 1 2 3 4 5 6 Kotaka M, Gover S, Vandeputte-Rutten L, Au SW, Lam VM, Adams MJ (May 2005). "Structural studies of glucose-6-phosphate and NADP+ binding to human glucose-6-phosphate dehydrogenase". Acta Crystallographica Section D. 61 (Pt 5): 495–504. doi:10.1107/S0907444905002350. PMID 15858258. 1 2 3 Au SW, Gover S, Lam VM, Adams MJ (Mar 2000). 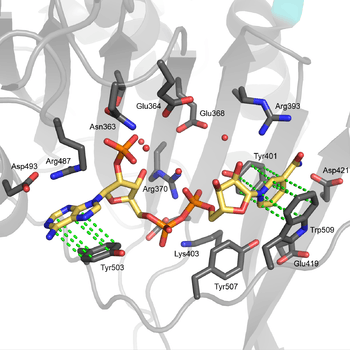 "Human glucose-6-phosphate dehydrogenase: the crystal structure reveals a structural NADP(+) molecule and provides insights into enzyme deficiency". Structure. 8 (3): 293–303. doi:10.1016/S0969-2126(00)00104-0. PMID 10745013. ↑ "G6PD glucose-6-phosphate dehydrogenase [ Homo sapiens (human) ]". NCBI. Retrieved 13 December 2015. 1 2 3 4 Kiani F, Schwarzl S, Fischer S, Efferth T. "Three-dimensional modeling of glucose-6-phosphate dehydrogenase-deficient variants from German ancestry". PloS One. 2 (7): e625. doi:10.1371/journal.pone.0000625. PMC 1913203 . PMID 17637841. ↑ Luzzatto L, Bienzle U (Jun 1979). "The malaria/G.-6-P.D. hypothesis". Lancet. 1 (8127): 1183–4. doi:10.1016/S0140-6736(79)91857-9. PMID 86896. ↑ Corpas FJ, Barroso JB, Sandalio LM, Distefano S, Palma JM, Lupiáñez JA, Del Río LA (Mar 1998). "A dehydrogenase-mediated recycling system of NADPH in plant peroxisomes". The Biochemical Journal. 330 ( Pt 2) (Pt 2): 777–84. doi:10.1042/bj3300777. PMC 1219205 . PMID 9480890. ↑ Bashiri G, Squire CJ, Moreland NJ, Baker EN (Jun 2008). 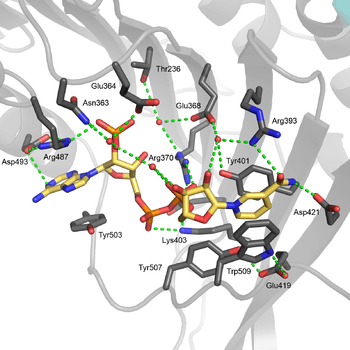 "Crystal structures of F420-dependent glucose-6-phosphate dehydrogenase FGD1 involved in the activation of the anti-tuberculosis drug candidate PA-824 reveal the basis of coenzyme and substrate binding". The Journal of Biological Chemistry. 283 (25): 17531–41. doi:10.1074/jbc.M801854200. PMID 18434308. ↑ Szweda LI, Uchida K, Tsai L, Stadtman ER (Feb 1993). 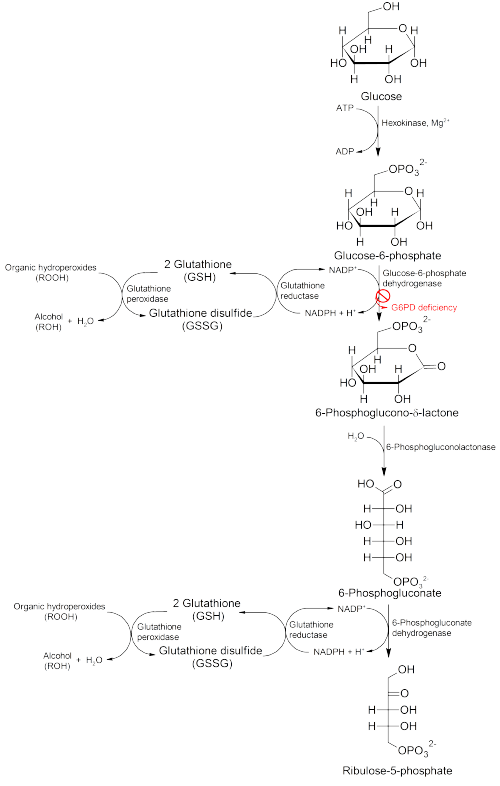 "Inactivation of glucose-6-phosphate dehydrogenase by 4-hydroxy-2-nonenal. 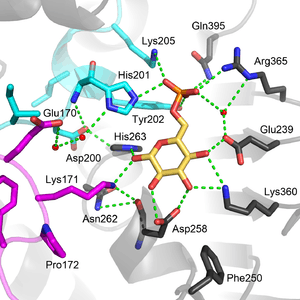 Selective modification of an active-site lysine". The Journal of Biological Chemistry. 268 (5): 3342–7. PMID 8429010. 1 2 3 4 5 6 7 Wang XT, Chan TF, Lam VM, Engel PC (Aug 2008). "What is the role of the second "structural" NADP+-binding site in human glucose 6-phosphate dehydrogenase?". Protein Science. 17 (8): 1403–11. doi:10.1110/ps.035352.108. PMC 2492815 . PMID 18493020. ↑ Wang YP, Zhou LS, Zhao YZ, Wang SW, Chen LL, Liu LX, Ling ZQ, Hu FJ, Sun YP, Zhang JY, Yang C, Yang Y, Xiong Y, Guan KL, Ye D (Jun 2014). "Regulation of G6PD acetylation by SIRT2 and KAT9 modulates NADPH homeostasis and cell survival during oxidative stress". The EMBO Journal. 33 (12): 1304–20. doi:10.1002/embj.201387224. PMID 24769394. ↑ Kletzien RF, Harris PK, Foellmi LA (Feb 1994). "Glucose-6-phosphate dehydrogenase: a "housekeeping" enzyme subject to tissue-specific regulation by hormones, nutrients, and oxidant stress". FASEB Journal. 8 (2): 174–81. PMID 8119488. 1 2 de Lartigue J (2012-06-12). "Cancer Research Moves Beyond the Original Hallmarks of Cancer". OncLive. ↑ "Entrez Gene: G6PD glucose-6-phosphate dehydrogenase". 1 2 Tian WN, Braunstein LD, Pang J, Stuhlmeier KM, Xi QC, Tian X, Stanton RC (Apr 1998). "Importance of glucose-6-phosphate dehydrogenase activity for cell growth". The Journal of Biological Chemistry. 273 (17): 10609–17. doi:10.1074/jbc.273.17.10609. PMID 9553122. 1 2 Xu SN, Wang TS, Li X, Wang YP (Sep 2016). "SIRT2 activates G6PD to enhance NADPH production and promote leukaemia cell proliferation". Sci Rep. 6: 32734. doi:10.1038/srep32734. PMID 27586085. Mason PJ (Sep 1996). "New insights into G6PD deficiency". British Journal of Haematology. 94 (4): 585–91. PMID 8826878. Wajcman H, Galactéros F (Aug 2004). "[Glucose 6-phosphate dehydrogenase deficiency: a protection against malaria and a risk for hemolytic accidents]". Comptes Rendus Biologies (in French). 327 (8): 711–20. doi:10.1016/j.crvi.2004.07.010. PMID 15506519.